Banbridge’s quest for an Irish Hockey double is going down to the final day. After last weekend’s Irish Senior Cup success, they concluded a tiring week with four points from the weekend, adding to a 3-0 win over Lisnagarvey in midweek. That, combined with Three Rock Rovers’ tenth win in a row, means the two sides go into the last round of EY Hockey League fixtures, scheduled for April 22, level on 42 points, although Bann are six goals better off. On Saturday, Bann edged out UCD 3-2 as goals from Eugene Magee and Dane Ward built a 2-0 first half lead before Jeremy Duncan inspired a student fightback. But Bruce McCandless’s strike put Mark Tumilty’s men out of range. A day later, Bann were unable to find a winner down the closing stretch against Glenanne as they had to settle for a draw, Olympians Eugene Magee and Shane O’Donoghue sharing the goals in a 1-1 result. It meant that Three Rock’s 3-0 win at Cork C of I, put the southern side level with Bann on 42 points. Mitch Darling got them started before Conor Empey and James Walker sealed the points. Banbridge face Railway on April 22nd with that six goal advantage over Rovers who play Instonians in their final match. And Instonians will go into that tie with their relegation already confirmed due to a 10-0 loss to Lisnagarvey. UCD remain in the relegation playoff while Railway Union missed a chance to move closer to safety as they saw five players yellow carded in a 5-4 loss against Pembroke. Alan Sothern scored four times to extend his lead in the goalscoring charts. Glenanne went safe by virtue of a Saturday win over Monkstown with Stu Ronan scoring in the closing minutes of a 2-1 win. 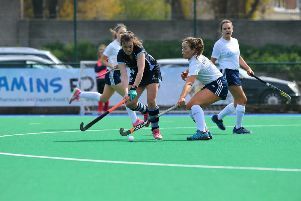 Town bounced back on Sunday to beat Instonians 3-1 to move into the top four and in range of a Champions Trophy berth. Elsewhere, Annadale won the five-team EY Provincial Playoffs series at the Merrion Fleet Arena with wins over Clontarf, YMCA, Belfast Harlequins and Cork Harlequins to progress to the second phase of the promotion series in a fortnight’s time.